With direct access to the top Maoist leadership, Rahul Pandita provides an authoritative account of how a handful of men and women, who believed in the idea of revolution, entered Bastar in Central India in 1980 and created a powerful movement that New Delhi now terms as India's biggest internal security threat. It traces the circumstances due to which the Maoist movement entrenched itself in about 10 states of India, carrying out deadly attacks against the Indian establishment in the name of the poor and the marginalised. It offers rare insight into the lives of Maoist guerillas and also of the Adivasi tribals living in the Red zone. Based on exten- sive on-ground reportage and exhaustive interviews with Maoist leaders including their supreme command- er Ganapathi, Kobad Ghandy and others who are jailed or have been killed in police encounters, this book is a combination of firsthand storytelling and intrepid analysis. Rahul Pandita, seen here in the jungles of Bastar, along a flooded river, with a friend. Rahul Pandita is a senior Special Correspondent with the Open Magazine. He is the co-author of the critically acclaimed book on insurgency: The Absent State. 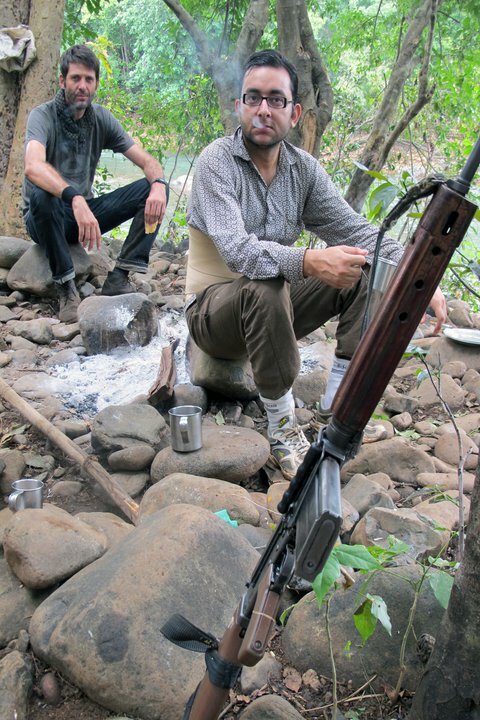 He has extensively reported from conflict zones ranging from Bastar to Baghdad.